Luxury billiards entertaining at it's finest. ​Perfect for maximizing functionality in your room while preserving the beauty. 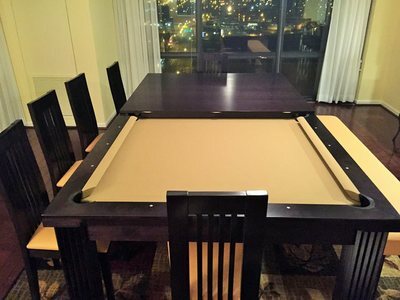 Converts in seconds from a beautifully crafted dining room table into a modern style pool table! Making it the ultimate combo, space saving luxury statement in your home. The low profile frame yields spacious leg room for dining. Pool tables are a great way to bring family and friends together to hangout and for years of enjoyment and relaxation. "Transforming billiard entertainment into exquisite pieces of dining art ~ and vice-versa." ​If you see a table in the gallery you like but would like it in a different color....no worries....we love custom orders. ​We have professional BCA certified installers in all 50 States. ​"I really loved working with Chic Pool!! They delivered a great product and in the short time frame that we needed it in. I highly recommend them!" Great love creates the perfect conversion pool table combo for you. 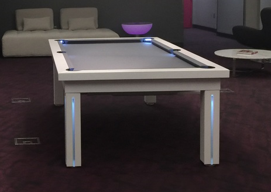 We take pride in our dining pool tables that are ultra modern, sleek, and crafted with expert accuracy. The designers and craftsmen that build yours use precision construction techniques that yield the most exquisite billiard tables in the world. Let us provide the dining billiard table of your dreams to compliment your home and will last for generations! ​Tournament grade quality materials and precision custom work.....ensuring your pool table will last a lifetime. 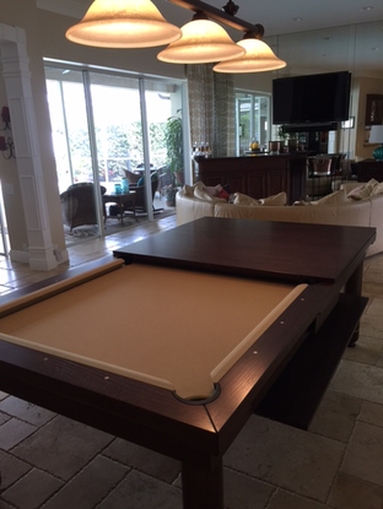 Review from another happy convertible dining pool table customer. ​ "Who says you can't have the best of both worlds! My wife went into action...research & hunting online only to find Brian from Generation Chic Pool! One word sums our experience and table up, AMAZING! It was a rush because of the holidays and he was in contact with us every bit of the way. We live in Florida and it was shipped from Chic Pool in just a few days! It is a great gathering area for my son, and entertaining friends and family! Well, we hosted the holidays this year for the family! It was everything and more than we expected!! In fact most of the holiday conversation was not about us and how we are doing but how we could eat dinner and then play a few rounds of pool afterwards, ha! We sat 10 at the table with plenty of room for serving trays, oh my! Great company, Great owner and Great product! "FYI, we are still so very much enjoying our table!!" ~ One year later and we are now ordering some benches from Brian to go with it." Generation Chic Pool...The perfect statement for your luxury living and billiard entertaining space.